A team of Wells College students and a pair of Auburn SCORE business advisers helped a King Ferry woman jump-start her organic garlic business. From left in this 2014 photo are SCORE mentor Nelsa Selover, Wells seniors Cassandra Smyth and Ryan Cook, business owner Dale Mangan, and SCORE mentor Gehan Shanmuganathan. 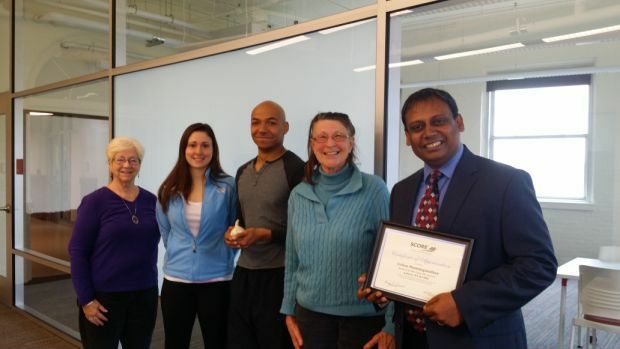 Shanmuganathan was given an award from the Service Corps of Retired Executives (SCORE) for his work with Colgan Farms. Do you like to build or grow things? Do you have ideas for making life better, easier or more fun? Do you sometimes think you could make money from your ideas? What holds you back from doing these things? Is it business knowledge, connections or startup money? Are you an entrepreneur? Most people have something they do or would like to do, and think they could make money doing it. We use the term “entrepreneur” to describe the people who take those ideas and make a business (or businesses) out of them. They come from all sorts of backgrounds, and the skills it takes to be a good entrepreneur can be learned. There are different reasons people become entrepreneurs. Some just want to make a job for themselves, some want to make lots of money, some find it to be a good way to make a difference in the world, and some want to follow their passion and make a living out of it. Before you start a business, you need to think about where you are in life. Starting a business is a lot of work. Do you have the time needed to make this business a success? Are you ready for the income uncertainty that can come with starting something new? You also need to plan. 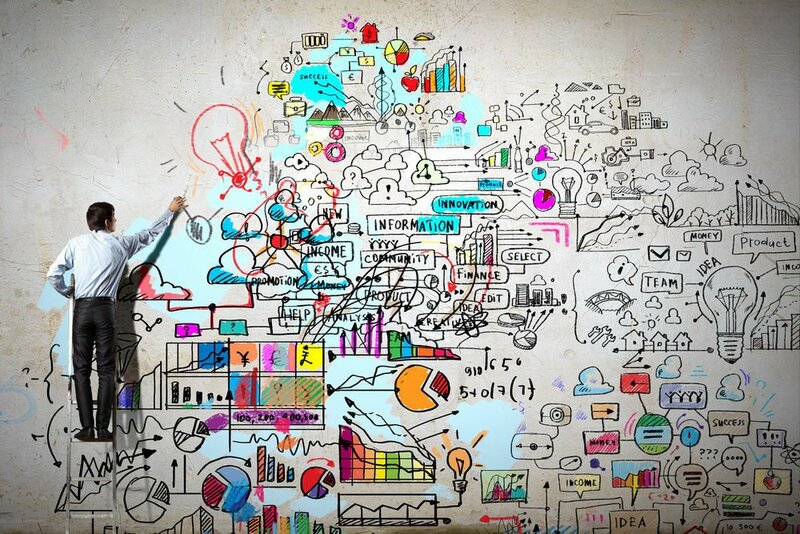 Numerous studies have shown that businesses that start with a business plan are more likely to succeed. There are several reasons for this. The most obvious is financing. If you need to raise money from investors or from a bank loan, they’re going to want to see a business plan. There are other reasons as well. The process of writing a business plan forces you to do research and take the time to think through your idea. This process can cause you to make adjustments to your plan, and to define it more clearly. It also can help to weed out business ideas that won’t work. If you put together the financial section of your plan and can’t make the numbers add up, your ideas probably need some major adjustments. Entrepreneurs make a big impact on the economy. According to the Kaufman Foundation, new businesses created an average of 1.5 million new jobs per year in the United States over the past three decades. There are also other benefits to having more local startup businesses. Local companies are less likely to relocate as the company grows, and revenues are more likely to be reinvested locally than those of non-local companies. If you’re thinking about making the leap, the Cayuga Economic Development Agency and the Auburn SCORE chapter are here to help. We meet one-on-one with aspiring business owners and can help you at any stage along the path to starting a business. CEDA, along with Auburn SCORE, plays an essential role in our community’s entrepreneurial ecosystem by serving as way to connect people who have ideas with the knowledge and services they need to succeed in starting and managing a business. We can help you write a business plan, we can connect you with technical assistance or other local companies that can help you on your path to business success, and we can help connect you to financing. CEDA and Auburn SCORE also occasionally host business startup classes and are planning a monthly local entrepreneur networking event starting later this year. Do you have some experience in business that you’d like to share with people just getting started? The Auburn SCORE Chapter is looking for new business mentors. Regardless of your reasons for wanting to start a business, the Cayuga Economic Development Agency and the Auburn SCORE chapter can help with free and confidential advice for local businesses. If you are thinking of starting a business, or have some experience and want to help others start businesses, give us a call. Derek Simmonds is the Cayuga Economic Development Agency's business development specialist and can be reached at (315) 252-3500 or dsimmonds@cayugaeda.org. For more information about the agency, visit cayugaeda.org. Prayer to the Blessed Virgin C.A.G.